I have tested and used every WiebeTech bare drive dock going back to the original FireWire Drive Dock, released around the time Steve Wozniak stopped shaving. UltraDock v5 from CRU-DataPort, the parent company of WiebeTech, is the best drive dock ever, period. It has been years since v4 was released, and the long wait was worthwhile. The premise and purpose of UltraDock v5 (abbreviated here as UDv5) is straightforward for a techie and completely bewildering to a normal person. When an internal hard drive, such as the one residing within your Macintosh or iOS device, is removed from the case of the source product, the exposed hard drive is often still usable even when the computer or iPod or iPhone or iPad has stopped working. A technically savvy person in a Mac repair shop, or your cousin’s next door neighbor’s brother-in-law, typically can retrieve the crucial data from the exposed internal drive that is now external, if not by choice. Enter UDv5, center stage. 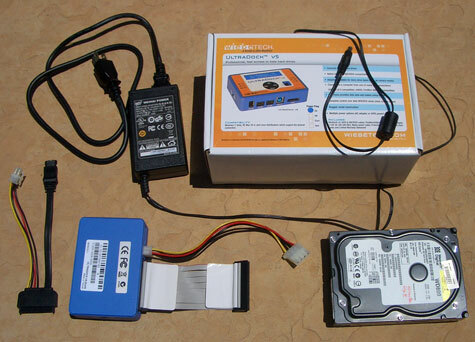 Attach and power up the exposed internal drive using one of the included interface connectors on USv5UDv5, or an accessory adapter if required, and within seconds (hopefully), the orphaned drive is mounted on the computer being used to extract the drive’s precious data. Next a fresh external drive or computer can be used to transfer as much or as little data as is desired from the internal drive, and your heart can go back to its normal non-scary beat. Obtain another computer or iOS device, copy your files over to it, and you are back in action. I do this frequently for my clients and tutorial students, and they are impressed with the efficiency of the process, once they pass through the denial phase concerning their non-functioning Mac or iPod. Note: internal hard drives from all computers and classic iPods are extractable, but removing the internal flash storage from recent iOS equipment is problematic, and should not be attempted if you are not certified to do so. What makes UDv5 better than any of its predecessors is the new LCD screen and menu system, in addition to improved chipset and interface options. Please study the product page for complete stats and features. USv5 is small and compact and very cool to operate in more ways than just temperature. Before I went on vacation recently I attached two internal 3.5 inch IDE drives to UDv5, one at a time, and did full backups of my two primary Macintosh volumes. I then placed these bare drives, with base plates securely attached, into my bank’s safe deposit vault. USA, UK, European, and Australian power plug models are available. I am not impressed with the durability of the third party power cable CRU-DataPort is using, and the company is aware of this ongoing complaint I have. The ribbon connector that is provided is, like all such ribbons, vulnerable to misuse and accidents. This is another area where WiebeTech can improve on a product with a $249 price tag. UDv5 does what it is supposed to do. Its new information-loaded LCD display adds enormous value to an already top of the line product. 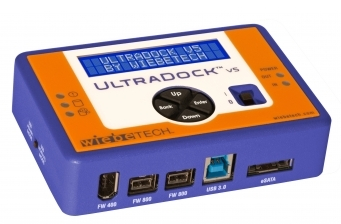 I plan to have additional comments on WiebeTech’s UltraDock v5 as I continue to use it with an extended variety of FireWire, USB, and eSATA exposed drives.